The chakras, the seven centers of spiritual power within the human body, have a strong connection to our yoga practice. And this week I'm back with the second of my series of seven practices, where each one is devoted to an individual chakra. Moving on up the chakras, it's time to delve deep into the sacral chakra. It is located in the pelvis (under the belly button and above the pubic bone). This practice and this chakra deal with themes of creativity, passion, pleasure and sensuality. As in the first practice of the series, I will be pairing each asana with an affirmation. Your job here is not to try to convince yourself of the truth of the affirmation, but to repeat it to yourself a couple of times and observe your own personal gut reaction. Some of these may be easy for you to hear and agree with, meaning there is probably not much work for you to do within that theme. While others may make you feel resistance, tension and strong emotions, indicating a need to spend some time working with this theme (and perhaps a wound to heal). I highly suggest having a journal handy, and to write down what you feel in these moments to go back to later. All of these poses will be deep and possibly challenging hip openers. Have props at the ready! I use 2 blocks here, but you are welcome and encouraged to have handy whatever props will make you feel most comfortable (i.e. bolsters, pillows and/or blankets). 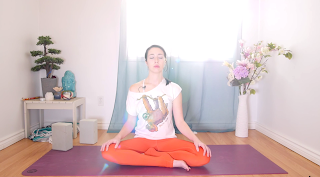 If you missed the first chakra practice, catch it here (before of after this one). 1. Seated Meditation - Take a moment here to initiate your connection to the sacral chakra. Sit comfortably, letting your hands rest on the knees. Close your eyes and feel your body soften with every exhale. Melt away the tensions and stress of life off the mat. Breathing through the nose, begin to soften the breath. Send each inhale to the low belly space of the sacral chakra. Visualize a glowing orange jewel, which brightens with every breath. As you breathe into the chakra, repeat your first affirmation. Affirmation: "I love and enjoy my body." 2. Winged Dragon - To set up for this variation of low lunge, make your way to hands and knees with the blocks close by. Step the right foot to the outer edge of your right hand. Double up the mat or use a blanket under your left knee for added support if you feel any discomfort there. You can choose to stay here in a standard low lunge with the right knee and toes pointing forward. Or for winged dragon, lift the right toes and spin onto the outside of right foot. The knee will also drop open towards the right side. Stay up on hands, or begin to lower onto your forearms or a set of blocks. If you fold down, you may find it comforting to place a block under the forehead so that your neck can relax. Ease your way to your edge. If you find your breathing is altered in any way, you've gone too far and should ease back. Affirmation: "I have healthy boundaries." Left side - Returning to table top, take some movement through the hips. Then set yourself up in the same pose, but with the left foot forward. Affirmation: "My creativity is endless." 3. Swan Pose - Returning to table top, keep your blocks close by. Bring your right knee behind your right wrist. Extend your left leg back behind you. If the right hip is high off of the ground, you can put a block underneath you here for support. Keep hips and shoulders squared forward. Lower to a block, forearms or hands, resting the forehead down. Ground the left hip down as far as possible, so that you're not rolling over onto right leg. Relax your chest, shoulders and arms. This is a deep, deep hip opener, and as such it really activates the sacral chakra. Affirmation: "My sexuality is sacred." Left side - return to table top and then bring left knee to left wrist, setting up for the other side. Affirmation: "I am open to intimacy." 4. Butterfly Pose - Come to lay down on your back. Bring the soles of the feet to touch, opening the knees out to the sides. If your knees are lifted, you can always bring a block underneath you for support. Play with the distance between your heels and pelvis. Take yoni mudra by touching the index fingers together, and thumbs together, to make a triangle shape. Place your hands in yoni over the sacral chakra, breathing into the space under your palms. Try to release any tension from the legs, melting into the shape. Affirmation: "I allow myself to experience pleasure." 5. Reclined Spinal Twist - Bring feet to floor and prepare to take an IT band stretch. Cross the right ankle over the top of the left thigh. Flex your foot. Instead of pulling in the left knee in this figure four shape, drop the legs to the left and try to place the right foot flat on the floor (or a block, cushion or blanket). To deepen the sensation, walk foot towards the chest. Hold onto your ankle with left hand, or use the hand to push right knee/thigh away from you. Reach right arm out to the side and look to the right to help ground your shoulder down. Breathe into the low belly. Affirmation: "My power lies in my sensitivity." Left side - after some stretches, set up with left ankle on right thigh and lower to the right. Affirmation: "I am open and receptive to connection and intimacy." 6. Happy Baby - Hug your knees in toward your chest. Separate them wide (towards your sides). Hold onto your knees here, or grab the outsides of your feet and lift them up to the sky. Flexing the feet and keeping the knees deeply bent. Keep your tailbone, shoulders and head down to the mat. Don't strain your arms to pull deeper, but rather work with gravity. Affirmation: "I live life with passion." If you enjoyed these poses, but would find it easier to focus if I talked you through them, practice along with the video below.